This certification is for programmers experienced using the Java programming language. Achieving this certification provides clear evidence that a programmer understands the basic syntax and structure of the Java programming language and can create Java technology applications that run on server and desktop systems using J2SE 5.0. This course covers training for certification exam 1Z0-851, same as Version SE 6. To achieve this certification, candidates must successfully complete one exam. It is not necessary to be a Certified Java Associate prior to taking this exam. Hands-on Labs - a perfectly simulated, real-world environment to test skills without risk. Practice Exams - Simulated certification exams designed to validate exam readiness. Mentoring provides personal access to our talented group of expert instructors in a unique collaborative environment. Students can correspond with the Instructor Team 24x7. Use of objects, classes, inheritance, and polymorphism in Java. Code involved in declaring a main method and identify the command lines used to compile and run an application. Create, compile, and execute a Java application. Appropriate lexical element to use for a given scenario. Code involved in declaring primitive variables and defining literal values. Code used to declare and initialize Java string literals and arrays. Build expressions and determine the value of an expression variable for a given code sample. Evaluate an expression, and evaluate a compound expression using operator precedence. Identify valid primitive type conversions and casting operations. Create expressions and compare integers in a specific application. Write if and switch statements for a given scenario. Specify the code to use while and do-while loop constructs to perform iteration, and identify the functions of the break and continue keywords. Standard and enhanced for loop constructs to perform iteration over arrays and multi-dimensional arrays. Selection statements and loop constructs for a given scenario. Encapsulation affects a class, pass messages between objects. Declare a specific class and a constructor for a class. Method and implement a variable argument list in a method for a given scenario, and declare a variable in a class based on that variable's scope. Write an appropriate class and method declaration, and pass variable arguments to a method. Create an object, call an object's method, and assign the result of the method to an existing variable for a given scenario. Enumeration and object, iterate over the enumeration's values, and call one of the object's methods. Create a package in a given scenario, and import classes, static methods, and variables into a source file. Appropriate level of access to apply to classes, variables, methods, and constructors for a given scenario. Create and import a specific Java package, import static methods and variables into a source file, and identify the access levels of the class members in that package. Code required to create a subclass for a given scenario. Inheritance class structure for a given scenario, and extend a superclass. Specify the code required to create abstract classes and methods for a given scenario, and recognize the code required to create a class that implements an interface. Declare, access, and initialize Java instance and class members in a given scenario. Final modifier to declare variables, methods, and classes for a given scenario. Declare and initialize variables, and declare and call methods in an enterprise scenario. Garbage collection is implemented, and the function of the finalize method. Instantiate inner classes for a given scenario. Generic, type safe version of a given piece of legacy code. Code involved in building a generic class for a given scenario. Required code to declare a generic subclass, test generic object types, and cast a generic object. Convert a given application's legacy code into a generic type safe equivalent. Retention policies and built-in annotations with their corresponding features and functionality. Code to annotate an overriding method, a deprecated method, and to suppress compiler warnings. Inspect and represent a custom annotation, write an annotation processor, and run the processor against a set of annotations. Create and implement a custom annotation for a given scenario. Valid reference type conversions between classes, interfaces, and arrays. Casting operations between classes, interfaces, and arrays for a given scenario. Methods of the Object class and Comparable interface to clone and compare Java objects for a given scenario. Clone, compare, and cast Java reference types. Thread class and Runnable interface to create a multi-threaded application for a given scenario. Code involved in changing a thread's state and priority. Synchronize thread access to code in a multi-threaded application for a given scenario. Create a multi-threaded program in a given scenario. Code required to use try, catch, and finally blocks to handle exceptions for a given scenario. Appropriate method of the Throwable class to use in a given piece of code, and associate runtime and checked exceptions with the events that throw them. Handle exceptions in calling methods, create and throw exceptions explicitly, and use exception chaining to set the cause of a thrown exception. 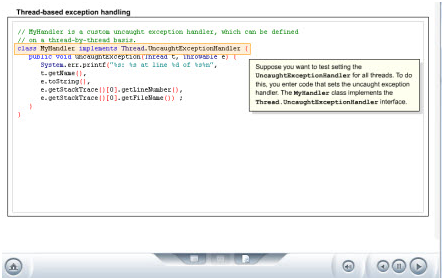 Create an exception subclass for a given code sample, and implement exception handlers on a thread basis. Create, throw, catch, and handle exceptions for a given scenario. Code used to create a Java assertion statement for a given scenario, and specify the commands and flags used to create and compile assertions. Methods of the Math class to determine the value of a variable in a given piece of code, and associate the new methods of the Math class with their corresponding functions. Utility methods of the wrapper classes to compare wrapper objects, transform values into strings, and extract values from wrapper objects. Code required to test the equality of strings, carry out pattern matching in regular expressions, and modify strings and string buffers for a given scenario. String class to manipulate strings and define regular expressions. Code required to modify system resources for a given scenario. Code used to access, modify, and launch system properties, and create operating system processes for a given scenario. Access and edit system environmental variables, launch system processes, and retrieve system timing information. Manipulate and traverse the elements of a collection for a given scenario. Collection class to modify, sort, and search a collection in a given scenario. Iterators to traverse the elements of a list in a given code sample, and sort and modify the list elements using the Collections class. Collection classes, interfaces, and method implementation to meet the requirements of a given scenario. Set up and display Swing container objects in a specific Swing application and launch that application. Guidelines associated with painting in Swing and AWT. Handling events for Swing components and displaying these components in a GUI application. Create and initialize an applet for a given scenario. ert applet tags using the HTML converter tool. Create and deploy an applet. Associate the features of the applet security model with the functions they provide and identify the restrictions that it imposes on applets. Play sound files and display images, documents, and status information in a given applet. Support applet persistence, locate applets for communication, and access JApplet panes for a given scenario. Locate applets for communication, add an audio clip to an applet, and display status information in an applet.